The Next Generation Launch vehicle structural acceptance test to verify composite material strength has taken place at Orbital ATK. Orbital ATK has successfully completed an important milestone in developing advanced solid rocket propulsion and other technologies to be used in a new generation of intermediate- and large-class space launch vehicles. 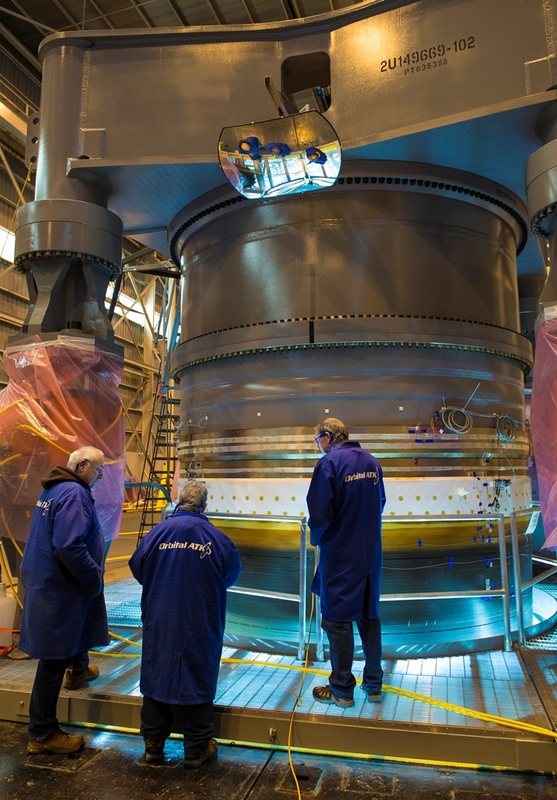 The company is in early production of development hardware for its Next Generation Launch (NGL) system, and on October 27 successfully completed the structural acceptance test on the first motor high-strength composite case for this programme. The applied structural loads during the test demonstrated over 110 percent of maximum expected motor operating pressure and 110 percent of operational/flight and pre-launch compressive/tensile line loads. This full-scale motor case segment will be cast with inert solid rocket propellant in early 2018 and shipped to the launch site to check-out ground operations. Orbital ATK’s NGL rocket family will be capable of launching the entire spectrum of national security payloads, as well as science and commercial satellites that are too large to be launched by the company’s current Pegasus, Minotaur and Antares space launch vehicles. The NGL vehicles will share common propulsion, structures and avionics systems with other company programmes, including smaller space launch vehicles as well as missile defence interceptors, target vehicles and strategic missile systems. The next phase of the programme is expected to begin when the Air Force awards the Launch Services Agreement in mid-2018, which would entail full vehicle and launch site development, with work taking place at company facilities across the country.